I don't eat scallops and none of my household eats steak, but would you believe it - we all eat chocolate mousse!! I am referring to Gordon Ramsay's Cookalong Live, which was shown on Channel 4 last Friday, and had people running to the shops to buy the ingredients. It was the first Gordon Ramsay recipe I have ever made and I thought the mousse was so-so. It had crème fraiche in it, which wasn't to my taste, but I really liked the addition of the Crunchie bars and will keep that in mind for future desserts! This is my entry for this month's Sugar High Friday, being hosted by CandyRecapper, and the theme is to make something with store-bought candy in it, hence the Crunchie. Break the dark chocolate into small pieces (reserving 25g for grating later) and place in a bowl that fits snugly over a pan of boiling water. Leave until the chocolate has completely melted and then remove from the heat and set aside. Add the crème fraiche to the melted chocolate and whisk until combined. Put the double cream and icing sugar into a separate bowl and whisk with an electric whisk until it forms soft peaks. Fold the chocolate mixture into the cream, add the coffee liqueur and stir to combine. Remove the chocolate covered honeycomb bars from the freezer, remove the packets and wrap them in a clean tea towel. Place the tea towel under a chopping board and press down hard on the chopping board to crush the honeycomb. Open up the tea towel and tip the crushed honeycomb into the mousse and gently fold through with a spatula. (I just bashed them gently with a rolling pin through the wrapper). The new lamp is in place and is even 'more awesome' than the one I broke - this one is a traditional shape with red lava. Cappuccino muffins are on the menu again. Yay! for the lava lamp update! 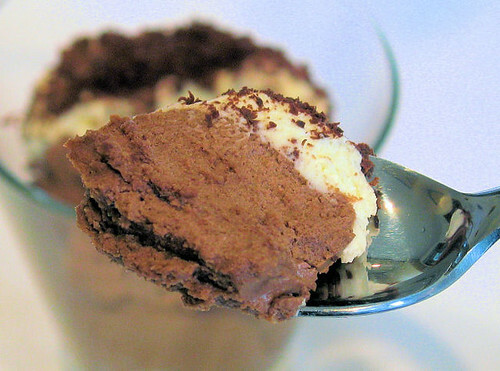 I'm sure you were pronounced "awesome" as well for making this mousse! I'm pleased about the lava lamp - we can all sleep again now! Your mousse looks much better than Gordon's did, I think you should email him and ask him to take a peek at how wonderful the chocolate mousse can look. I always watch Gordon Ramsey - don't like the language he uses but the man can cook. My sister and brother-inlaw went to his restaurant in New York and said it was fantastic! Your pictures look amazing and delicious. Nic,your picutres are great...as usual. I agree with Margaret, I think GR should see how good YOUR chocolate mousse looks! Hi thanks for dropping by my site. Nice looking dessert. I once forget a book I'd bought for one of my boys for Christmas. I never did find it so I guess I actually threw it out with the shopping bags. Beautiful pics and i'm in raptures here viewing this delicious chocolate dessert!! Gordon's desserts haven't been rating to well these days. These do look really good and i could never tell they were so-so unless u mentioned it. 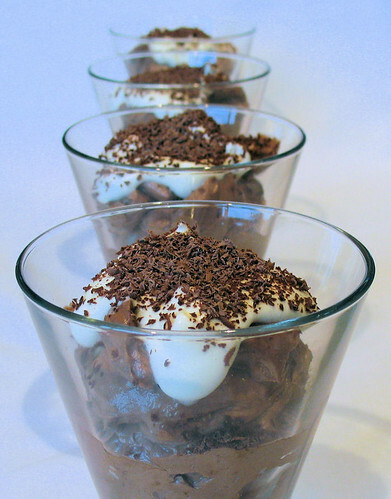 I know this sounds silly but u gotta try my recipe for a rich dark , smooth n silky choc mousse recipe. i swear by it and even today my friend called n asked me to make some. BTW love the addition of crunchie. Be careful - El Gordo may get a bit angry if you keep misspelling his name! Marie - you are probably spot on there! LyB - not quite, but that would have been nice! Aforkfulofspaghetti - sure, I'll pop one in the post! Margaret - thanks so much, sometimes things don't look so good on the tv do they! Chuck - thanks for visiting and no, we could do without the swearing - especially as my kids like watching it. I'm glad your sister and BIL enjoyed their visit to his restaurant. Barbara - I am so glad it's not just me, shame about the book! Rosie - thanks, and I'm so happy with the new lava lamp replacement! Kate/Kajal - your mousse looks delicious, and those fruit kebabs are the perfect match - thanks so much for the link! Brilynn - great idea to put them in some cookies! 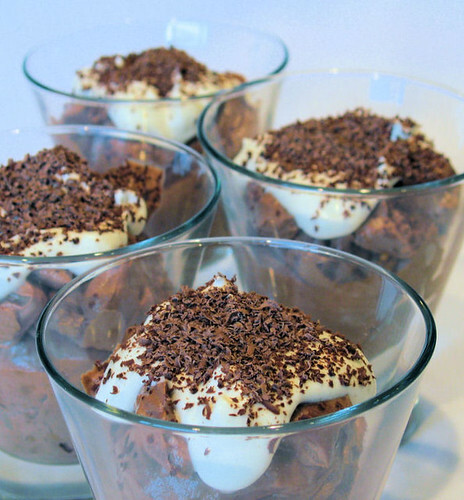 JEP - don't you just love mousse?!! Trig - oops, looks like I'm in line for a slapping with a wet noodle! Nic, you certainly know how to tempt me to make chocolate mousse. It certainly doesn't look so-so in your pictures. Glad to hear you got a new Lava lamp. I'll pass on the steak. I'll have a couple of scallops though. Then I'll have a big hunkin' bowl of your chocolate mousse. It's sensational. Glad to hear the lava lamp is back in its place of honour! Crunchie bars are one my faves with their sponge toffee centre!!! Sylvie - thanks, it does look tempting I must admit! It is chocolate after all!! Susan - I don't know why we save the dessert until the end - let's just go for it! Valli - got to love those Crunchie bars, especially when they melt in your mouth! hey, beautiful shot - love the first photo. Thank you so much SteamyKitchen! Scott - I have to agree with you there! I love the way you have presented these! So beautiful. I tried Gordon's recipe earlier this week and agree with you that the creme fraiche flavour is... a little overpowering, in some ways. But the addition of the Crunchie bars is definately a winner! Hi Antonia - it's interesting to hear your views on the mousse, and the Crunchie bars are really great! MMMMM.......Gordon Ramsey or the mousse,...???? The dessert of course!! !